► The Zone Tech Blind Spot Adjustable Square Mirrors are a Small Investment that will go a long while. Its Affordable price combined with its Sleek look, Safety features and premium quality make it a "Must Have" for drivers, taxicabs, carpoolers, teenagers or any car owner. The Zone Tech Blind Spot Mirrors easily mount to the original factory mirror with the Convenient stick on mounting. Although they can be placed anywhere you prefer they are typically place on the bottom outside corner of the original mirror. 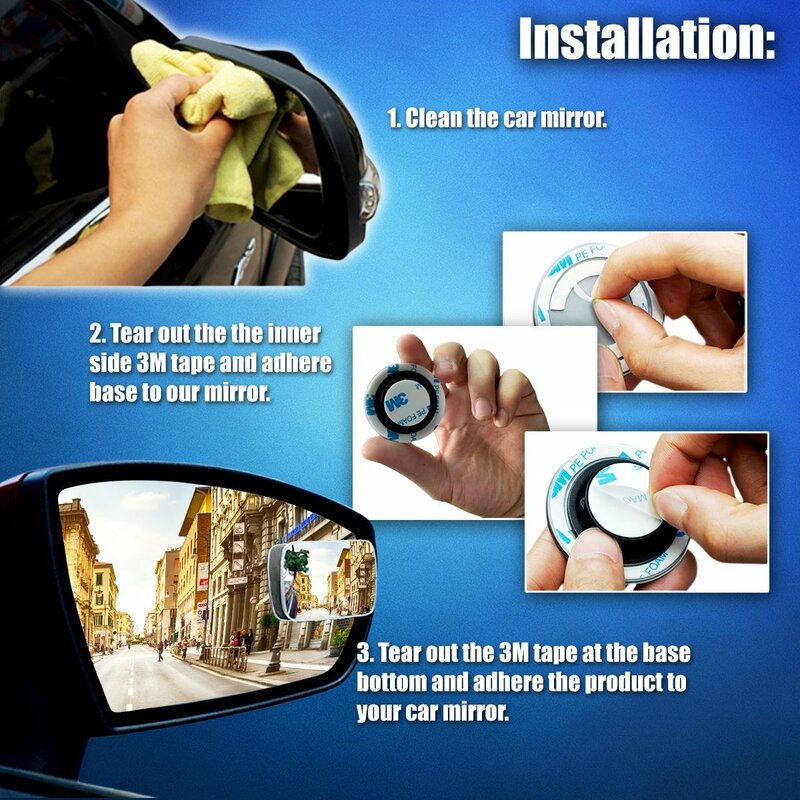 ► The Zone Tech Blind Spot Mirror Helps you avoid the dreaded and tricky blind spots. Passing lanes, changing lanes, merging onto freeways or even backing and parking the Mirrors will give you the Confidence and ability to do so easily. In addition they greatly Increase Safety by reducing the possibilities of unfortunate accidents. ► The Zone Tech blind spot mirror are constructed out of Premium Quality material so that they are Durable, Sturdy and Long Lasting. It has HD Glass curved male face frameless ultrathin slim design, equip with strength adhesive for pressure-sensitive tape installation. The Zone Tech blind spot mirror features a 360° Rotate + 30°Adjustabe, maximize your view with wide angle in car. Unlike the larger mirrors with the bulky black frame, the Zone Tech blind spot mirror won't take up a lot of space on the original mirror making it a most Handy car necessity. • ► GREAT VISIBILITY - The Zone Tech blind spot mirror gives you a realistic view 3X larger and clearer than other blind spot mirrors. The Zone Tech blind spot mirror also helps you avoid the dreaded and tricky blind spots. Passing lanes, changing lanes, merging onto freeways or even backing and parking the Mirrors will give you the confidence and ability to do so easily. • ► SMART DESIGN- The Zone Tech blind spot mirror features a 360° rotate + 30°adjustabe, maximize your view with wide angle in car. Unlike the larger mirrors with the bulky black frame, the Zone Tech blind spot mirror won't take up a lot of space on the original mirror making it a most handy car necessity. • ► PREMIUM QUALITY - The Zone Tech blind spot mirror are constructed out of premium quality material so that they are durable, sturdy and long lasting. It has HD Glass curved male face frameless ultrathin slim design, equip with strength adhesive for pressure-sensitive tape installation. • ► MUST HAVE - The Zone Tech blind spot mirror is a small investment that will go a long while. Its affordable price combined with its sleek look, safety features and premium quality make it a "must have" for drivers, taxicabs, carpoolers, teenagers or any car owner.